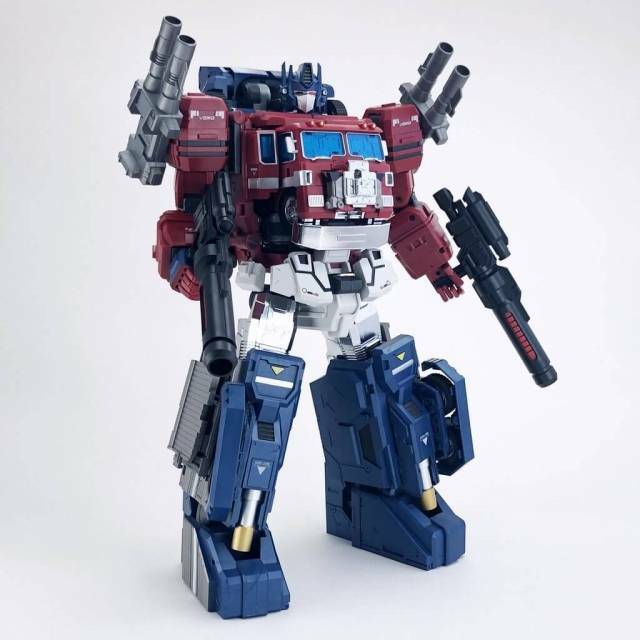 DX9's Gewalt towers over even MP-10 Optimus (sold separately) and is a Masterpiece scaled triple changer! Stands 24CM/9.5" tall in robot mode. Gewalt changes from robot to tank to plane and back and includes weapons as shown. I got him on his first run, and boy, he is AWESOME. 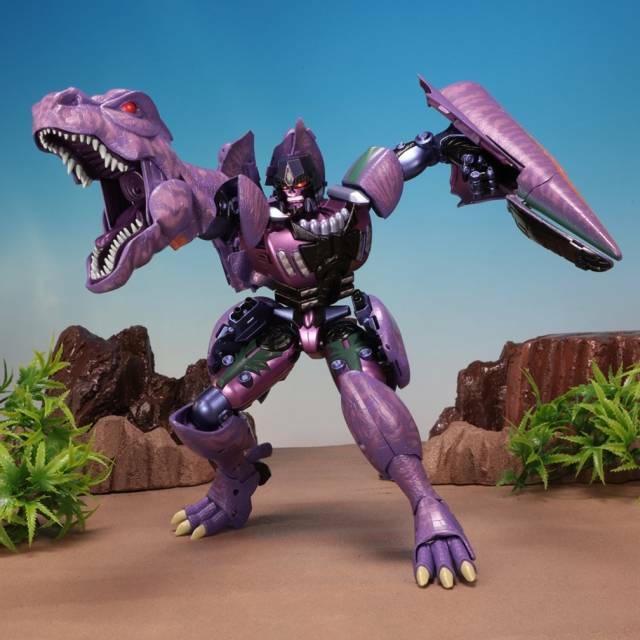 He is big, transforms nicely, poses well, has great articulation, and looks wonderful. The only complaints are echoes of other reviews, the side tail fins are kinda lame, and the tank mode could’ve been made to look cleaner. These are very minor complaints for a very major figure. 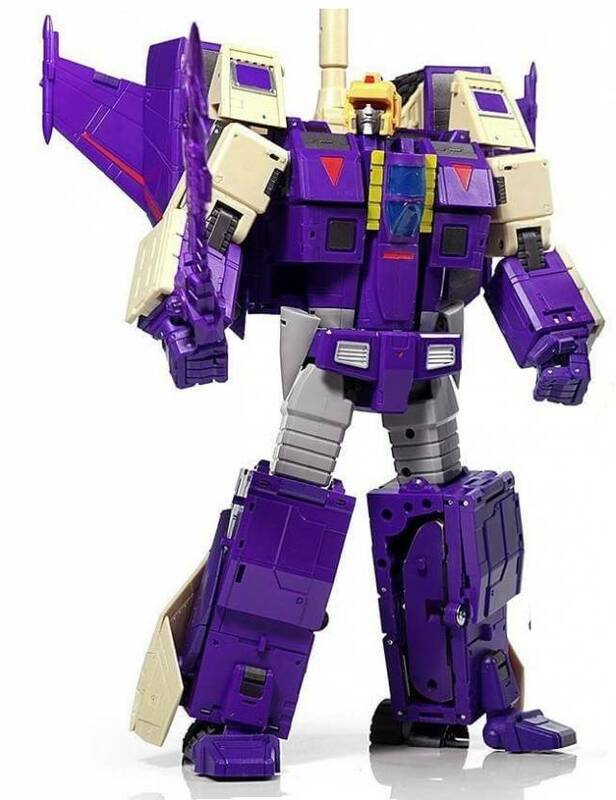 This is Masterpiece Blitzwing, in your face. Looks amazing in all 3 modes. Looks really nice alongside my DX9 Chigurh. Both really high quality 3rd party toys! My copy of Gewalt was a little stiff at first with some of the joints. DX9 included a pry-tool which works REALLY well. Everything loosened up after a day or so of transformations. 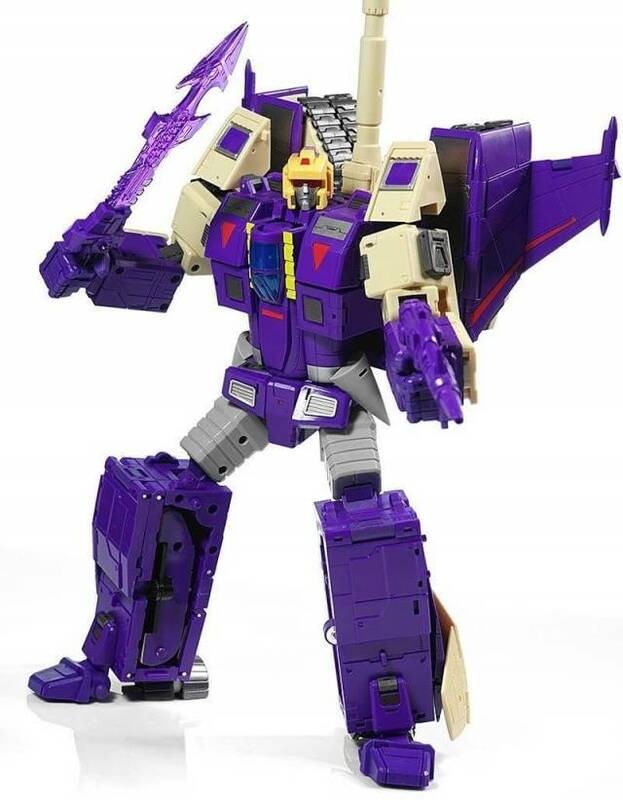 Best MP Blitzwing around. Would buy again, highly recommend! 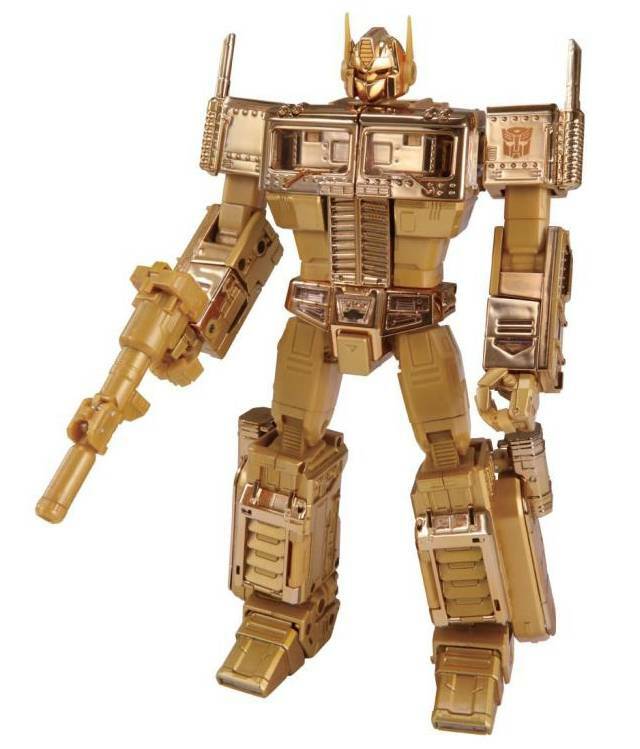 This was my second DX Transformer (the first being "Mightron") and the first Transformer I ordered from TF Source. Ease of payment/expeditious delivery aside, I'm very impressed with this figure all around. The tank mode is a bit underwhelming in my opinion. 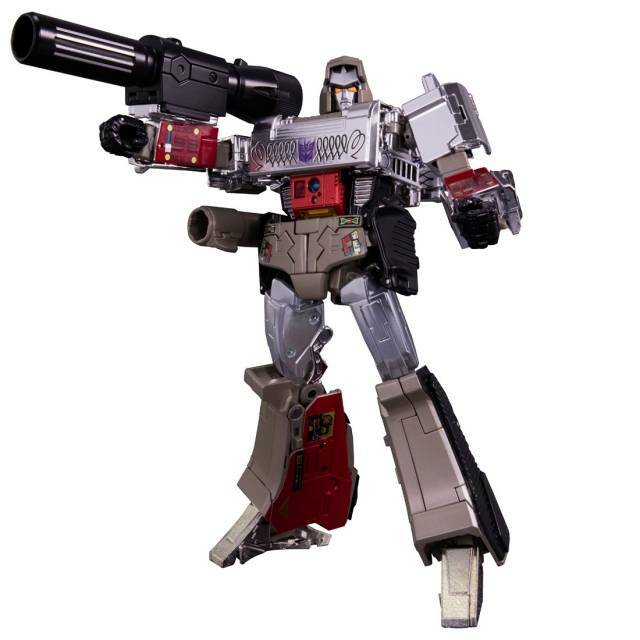 They tried to match the G1 toy/animated character with it, and while I appreciate that, it comes across as more "cute" than intimidating. The jet however is phenomenal. That sucker has some presence to it. I prefer displaying the figures as bots, but I may have to make an exception to the rule and have Blitz--I mean, Gewalt -- grace my shelf as a jet from time-to-time. Speaking of the bot mode, I don't have enough space to talk about how amazing it is. It has weight, it has mass, it is the shizzle. Transforming it was a breeze. I was a bit intimidated when I saw he came as a tank, and that I would have to go through two transformations to get him to a bot, but it wasn't hard at all. I've had a more frustrating time transforming Combiner Wars/Titan's Returns toys. Another nice feature is that Gewalt comes packaged with a little "Transforming Tool" that you can use to pry loose those tight fitting segments (think of it like a Lego brick-separator, only for Transformers). Anyway, this dude is aces. If you're a fan of the character, and if you want a big baddie to grace your shelf and dominate the Autobrats, you'd be hard pressed to find a better choice for this price. 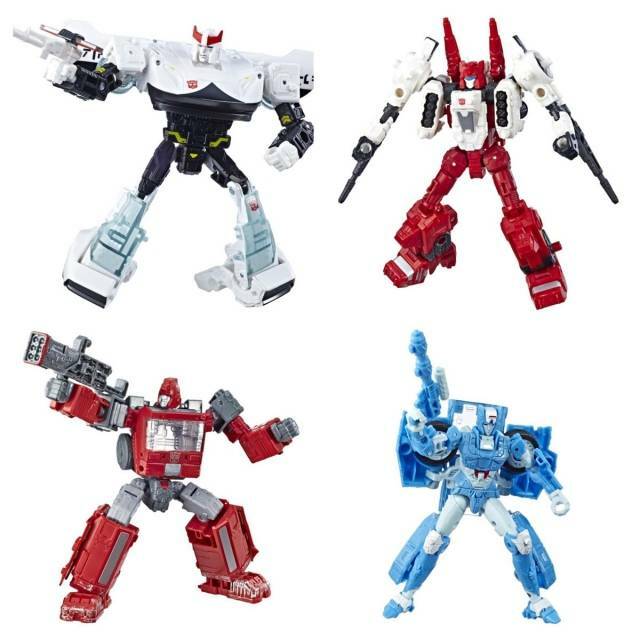 This figure is so unfair to the other 2 triple changes I have, that being "Astro Train " and "Octane". The size of it is great. It seem like it was double. 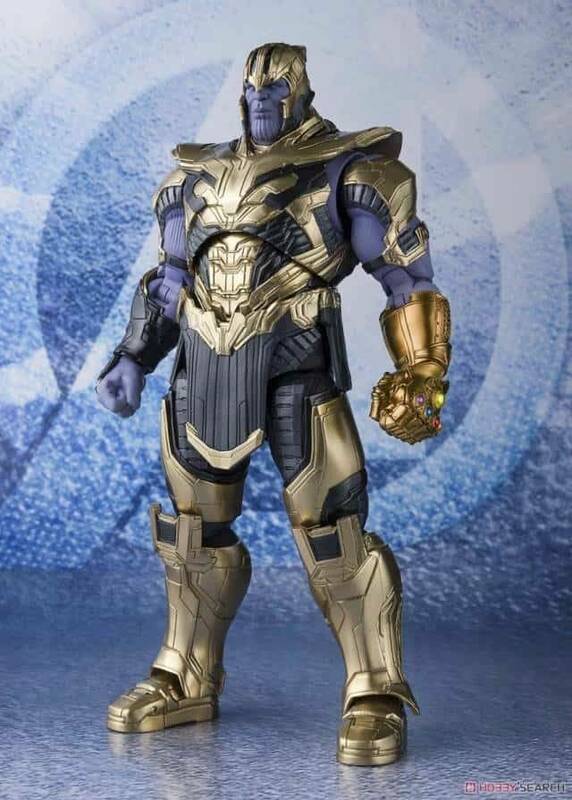 I hope more masterpiece figures get that size boost in the future. I'd give this guy 5 stars, to be perfectly honest. 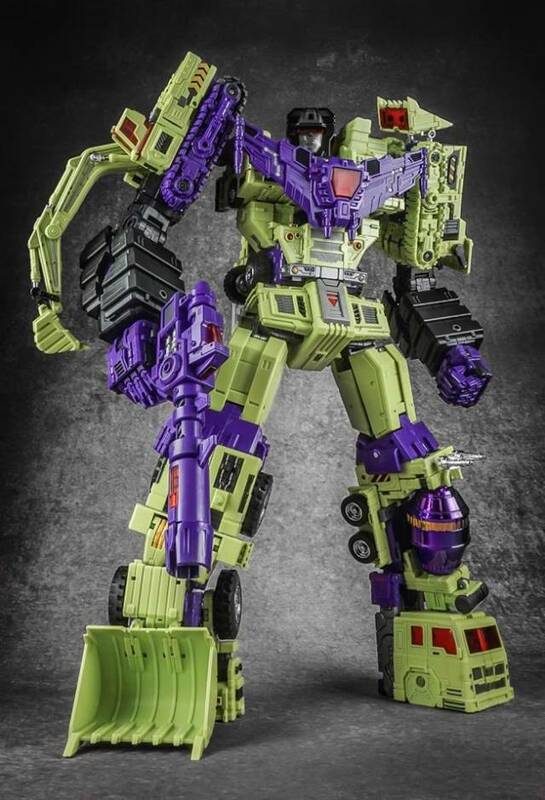 I know well the gripes that people have concerning this guy, the most notable of which is the visible head in tank mode, and the lower chest panels popping off in bot mode. The visible head doesn't bother me at all, and truthfully, it is my opinion that only a knitpicker would really allow that to be a deal breaker seeing as how he is a triple changer, and all three of his modes look really good. As far as the lower chest panels popping off, it is true that they can pop off easily during the course of transformation, but they pop right back in. After you get the hang of transforming him, it will cease to be a problem because you'll understand that those pieces are delicate, and so you're simply be more cautious with them. Overall, the transformation is complex but fun, the plastic is really high grade and he feels really sturdy. He's got a good amount of di-cast in him. 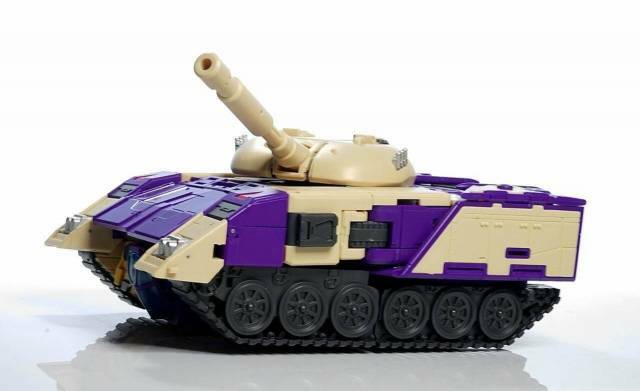 The piece that essentially connects his torso to his legs is one solid di-cast piece, and his tank turret also contains di-cast. Face sculpt is great, and I, unlike some, enjoy the light-piping for the eyes. He comes with an alternate "rage face" as well. The two sets of stabilizer fins on the rear of the jet mode, (his legs), do have a very minor clearance issue, but you shouldn't have a problem with transforming it after playing around with it a bit, and almost every Masterpiece or Masterpiece scale figure has a clearance issue of some sort. It's inescapable when it comes to this sort of engineering, really. I'd definitely recommend this guy. He feels really high quality. 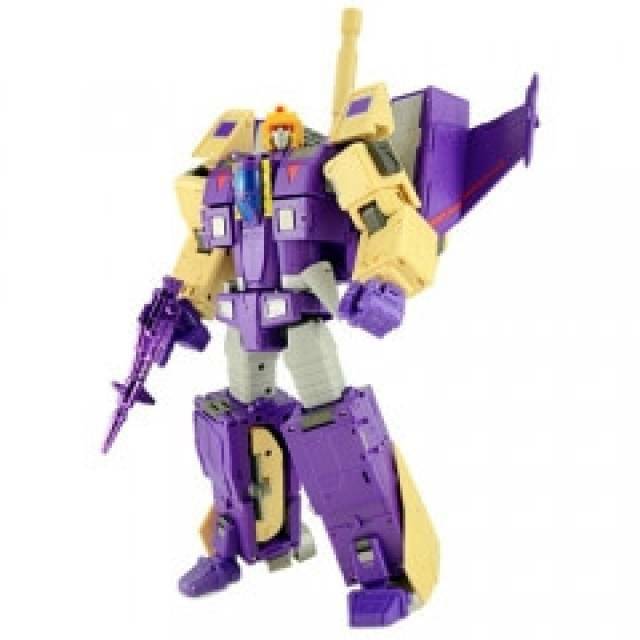 This figure is a fantastic Masterpiece-alike Blitzwing. All three modes fit together wonderfully, and he looks beautiful on display with a Masterpiece collection in any mode. He does have a few flaws however. 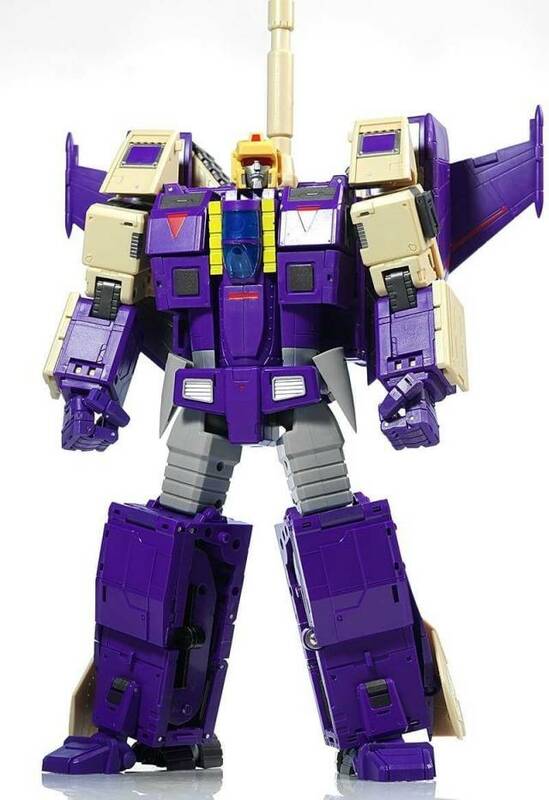 The rear tail-planes in jet mode seem to be added as an afterthought, and get in the way of folding up the fins on his legs. His forward landing gear comes loose quite a bit, but that may well be just my copy. My last complaint is due to my own stupidity more than anything: The nose-cone is painfully sharp, so be careful!